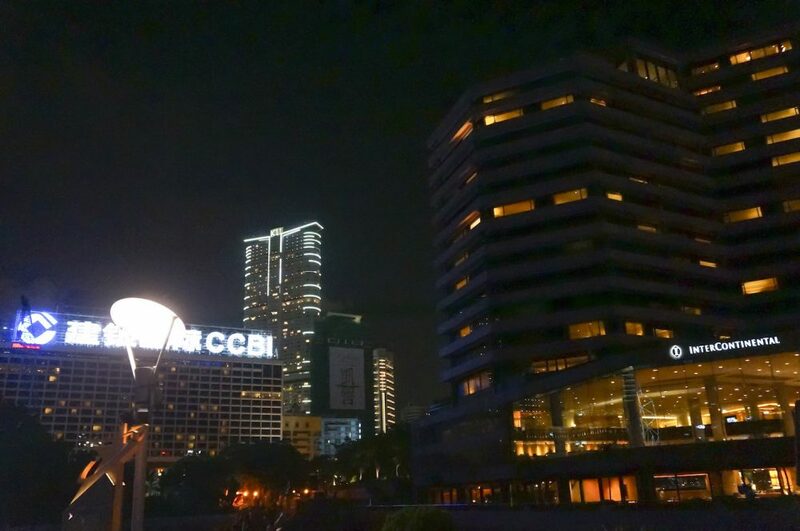 Visiting Victoria Peak made us tired, but instead of going back to the hotel, we suddenly decided to take another walk to enjoy Hong Kong at night. That means one place, Avenue of Stars! (Avenue of Stars, Here we come..!). 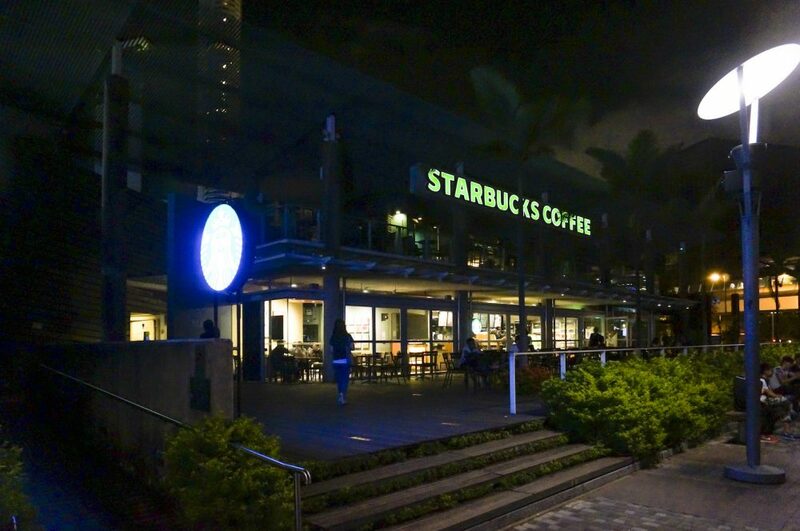 Well, this big city is really light up at night, there’s no reason to not enjoy the night walk here. 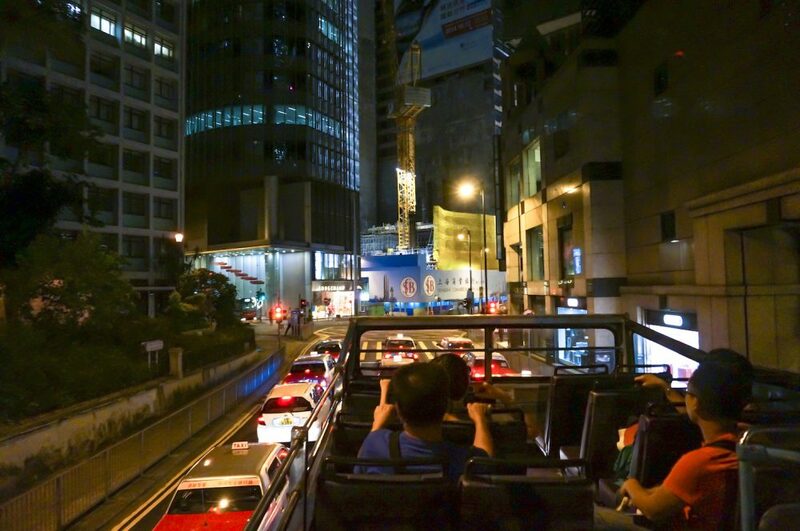 We took the bus from Victoria Peak lower terminus and get off at the Canton Road. Double Decker bus is really a lot of fun, I love it. 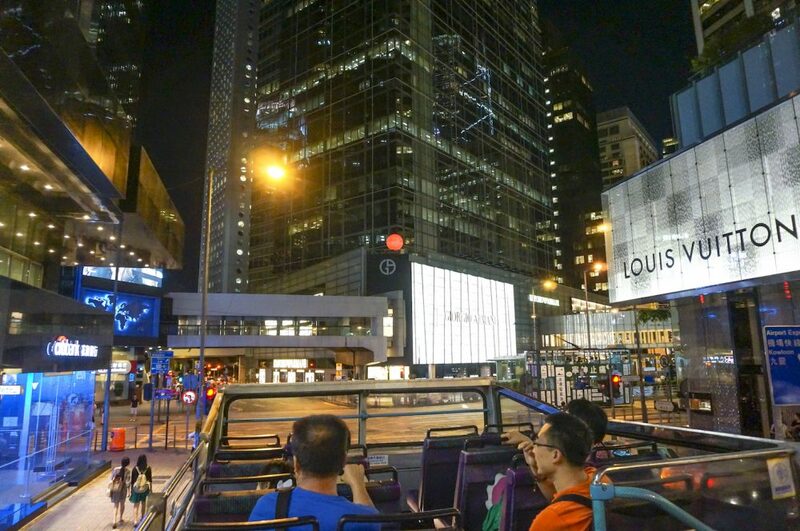 To enjoy Hong Kong city view at night on top of a double decker bus was really amazing. It’s a better view of course, and for you photographers, you must try going around the city sitting on a double decker bus, you will get amazing shots. I like the scenery this city create at night, the busy road, the giant LED boards shine so brightly illuminating a mix of colors on the street with those traffics. This is a lovely scene for any photographer. Check these photos. Great street view, right? Well saving up battery for Avenue of Stars, not so many photos taken that night. But, it was amazing. We took a walk from here to the east Tsim Sha Tsui. Took us about 10 or 15 minutes to walk. Now, I must say these night street views was hypnotizing, we walk casually and forget about the time. Avenue of Stars has a Light Show! D*mn it.. We rushed off, but it’s too late. I shot something else on the night walk. There’s still a lot of building that looks “British”. Especially the old buildings, but very well maintained. Hong Kong was under British Colonial rule for quite a long time. Now, here’s a brief short information about Avenue of Stars. Before I share my personal story. If there’s one place that you should visit at night in Hong Kong, the first place that comes up in our mind should be Avenue of Stars. It’s one of the most popular attractions for tourists or even locals at Hong Kong. If you have been there, you’ll know why it is famous, the place is very enjoyable, right? It’s basically a place to enjoy the view of Hong Kong skylines from across the bay of Victoria Harbor. This avenue was modeled on the Hollywood Walk of Fame, and located along the Victoria Harbor waterfront in Tsim Sha Tsui, Hong Kong. Built to pay tributes to honors celebrities of the Hong Kong film industry. The Avenue of Stars has a 400-metre long bridge section of a waterside promenade. It came into existence in 1982 and was subsequently transformed into Avenue of Stars in 2004. Cost HK$40 million to construct, financed by New World Group and supported by Hong Kong government. So yeah, it’s closed now and will reopen on 2018. You can see the official announcement on their site. Too bad we won’t be able to see it again for now, but excited to see what will the new Avenue of Stars be. It will be superb! The Avenue of Stars offers panoramic views across Victoria Harbor to Hong Kong Island. It is better to enjoy Avenue of Stars at night in my opinion. Well, I went in summer so you can imagine how the temperature will be showering under the sun just right at the harbor. But the good things about going by day is that you can take photos better with all the statues and plaque of the celebrities. The number of plaques has grown from 73, when the avenue first opened, to a current total of 101. Plaques of most living stars contain handprints set in cement and autographs. Some of the stars more familiar to audiences outside Hong Kong include Michelle Yeoh, Jackie Chan, Bruce Lee, Jet Li, Chow Yun-fat and Maggie Cheung. There are sometimes some stage performances or some other entertainments happen along this place, usually on weekends or public holidays. There are three souvenir kiosks along the Avenue of Stars, one of them dedicated to Jackie Chan merchandise. 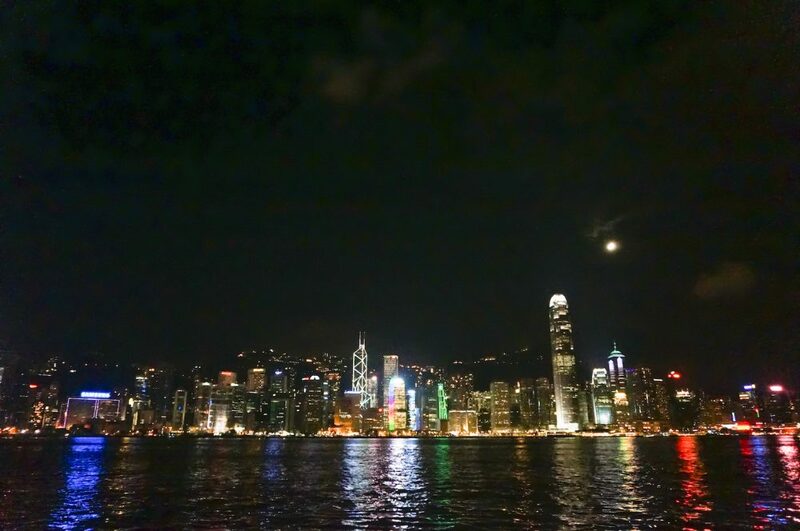 The avenue has panoramic views across the harbor to Hong Kong Island and makes for a pleasant stroll at any time of day, but particularly after dark when the Hong Kong Island’s famous skyline becomes spectacularly illuminated. For more info about the show. This is what we missed! Err.. Right after we pass some blocked construction site, finding a way to get to the waterfront. There’s the view, the killer view that makes everybody just chillin’ and enjoy that place. Of course, there’s still a lot of people. It’s only somewhere around 8.40 pm. There’s a lot of activities going here, from tourists busy with their selfie cameras and narcist stick, lovers spending time with the city skyline as the background (smart dating place! You don’t have to work it much, let the background do the job. Haha! ), even to families, group tours, and locals running (like an exercise, not running like criminal). Avenue of Stars at night. This is the view I’m talking about. Somehow, the view was just hypnotizing. It’s too bad we missed the Symphony of Light. It must be very beautiful. But now, since we were here, we just enjoy the walk, it’s a long walk, a lot of time to spent. Here’s some photos, a picture worth a thousand words, right? So let the pictures speak. If only I was there earlier, to record the show. And if only I knew photography better back then. It’s better to enjoy this place by yourself, you don’t have to buy a tour for this in my opinion since you will have a limited time to enjoy the beauty of this place. At least, that’s what I think. I saw a lot of group tours (those group of people with a flag, you know what they look like) spent about half an hour or maybe 1 hour only before their tour leader rush them back to another course or maybe end the day. 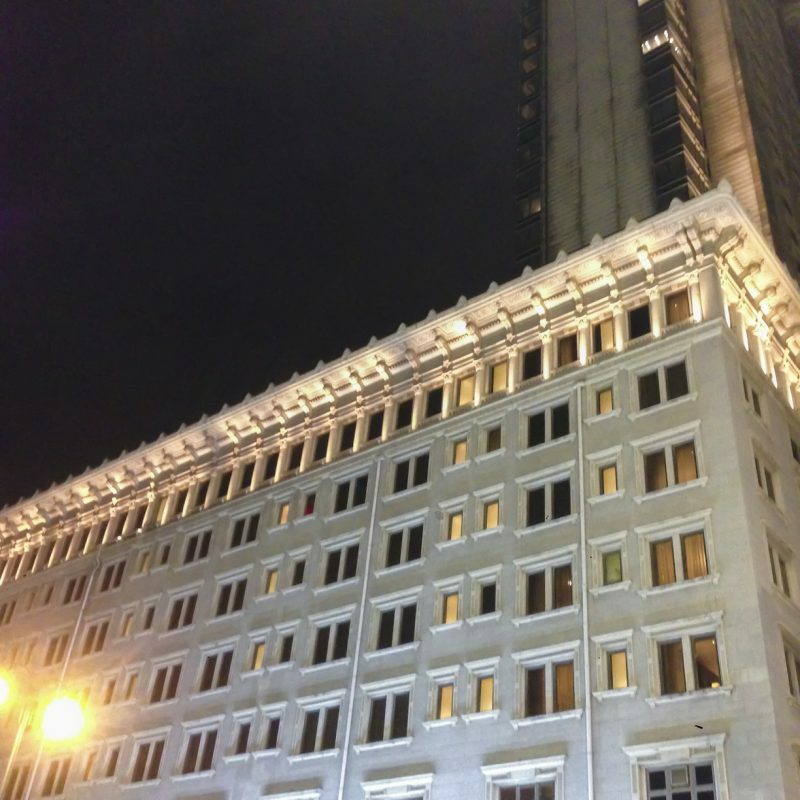 East Tsim Sha Tsui MTR Station, exit J, close to InterContinental Hotel is about 3 minutes walk from the avenue. Tsim Sha Tsui MTR Station, which is linked by pedestrian subway to East Tsim Sha Tsui MTR Station and has common exits is also within walking distance. Tsim Sha Tsui Star Ferry Pier is about 10 minutes walk from the avenue by following the promenade past the clock tower and along the harborside in front of Hong Kong Cultural Centre and Museum of Art. Star Ferry Bus Terminus is located at Star Ferry Pier (see above) and is the terminus for KMB services 1, 1A, 2, 5, 5A, 5C, 6, 6A, 7, 8 and 9. Routes A21, 8A, 13X, 26, 28, 35A, 41A, 81C, 87D, 98D, 110, 203, 208, 215X, 219X and 224X all stop on Salisbury Road, outside New World Centre, about 5 minutes walk from the avenue. Thank you for reading! Check these links below which might be useful for your next trip to Hong Kong. Until next post then. PS : This is trending! Wanna try to ride a Tesla? You know Tesla, right?